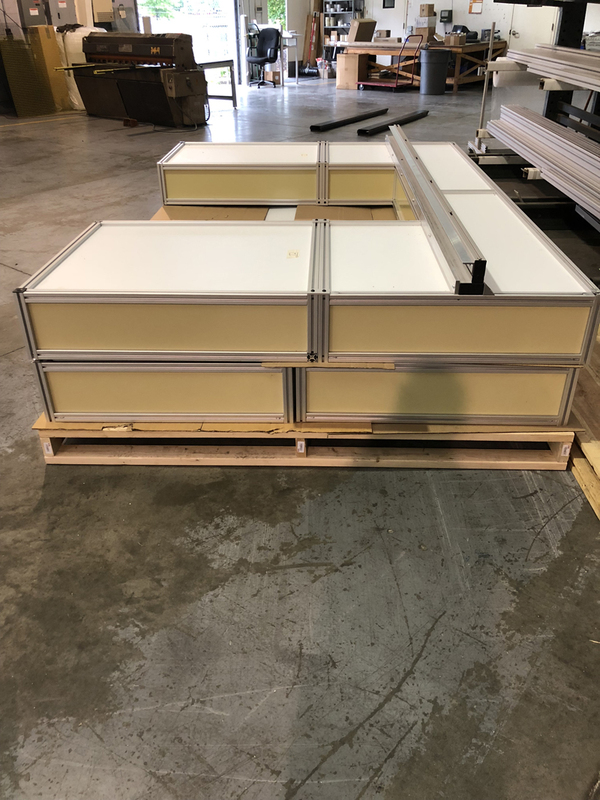 Alufab Inc. provides custom design and engineering for your T-Slot Aluminum Framing System projects. 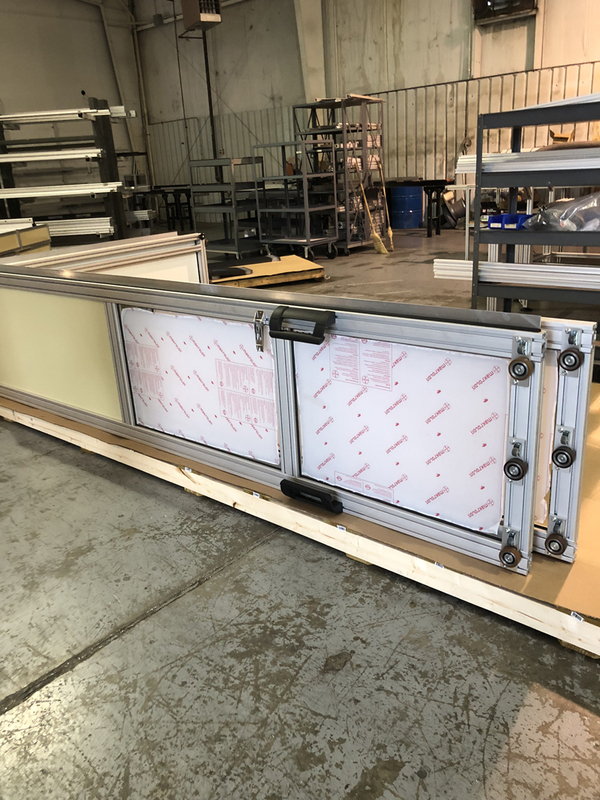 Our expert engineers can fabricate existing ideas and designs or, through consultation and collaboration, create an engineered solution that is brand new for you and your business. Our goal is to quickly provide a 3D CAD drawing, bill of materials and price quote. 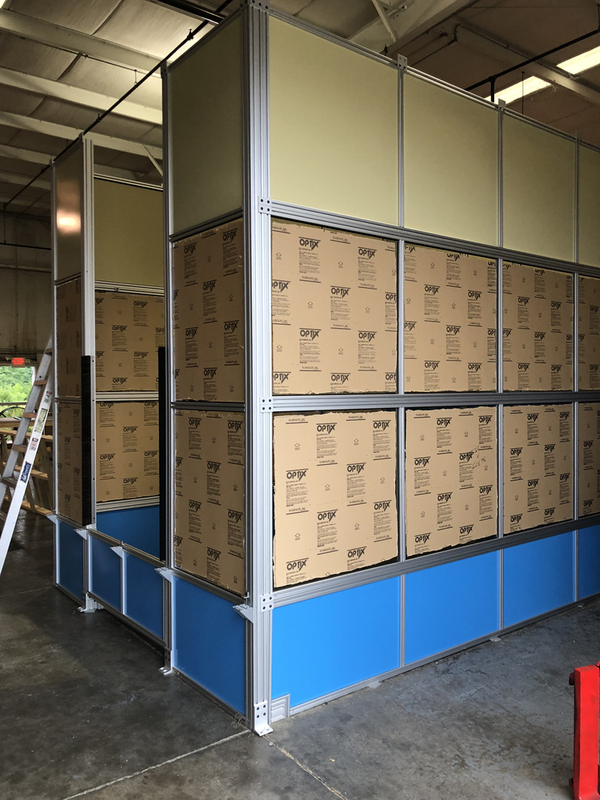 Custom design with a variety of aluminum framing systems is our specialty and our in-depth knowledge of how t-slot structural framing works insures that you will receive lightweight, strong, and resilient solutions for your business or event. 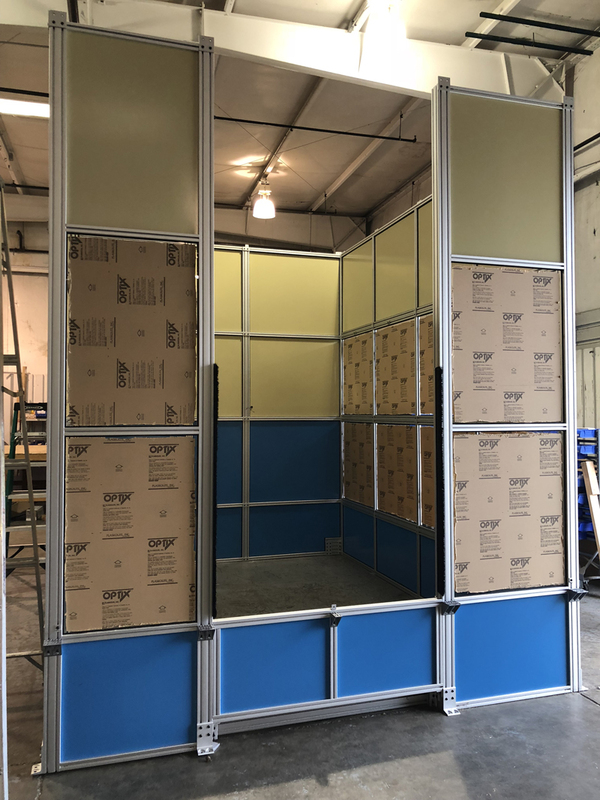 Whether you need guarding, workstations, displays, or special enclosures for your workplace, or you just need some input for your DIY garage or home workshop project, Alufab’s experienced engineers will come up with the solutions that meet your needs. Contact Us to talk about your project with an Alufab representative. 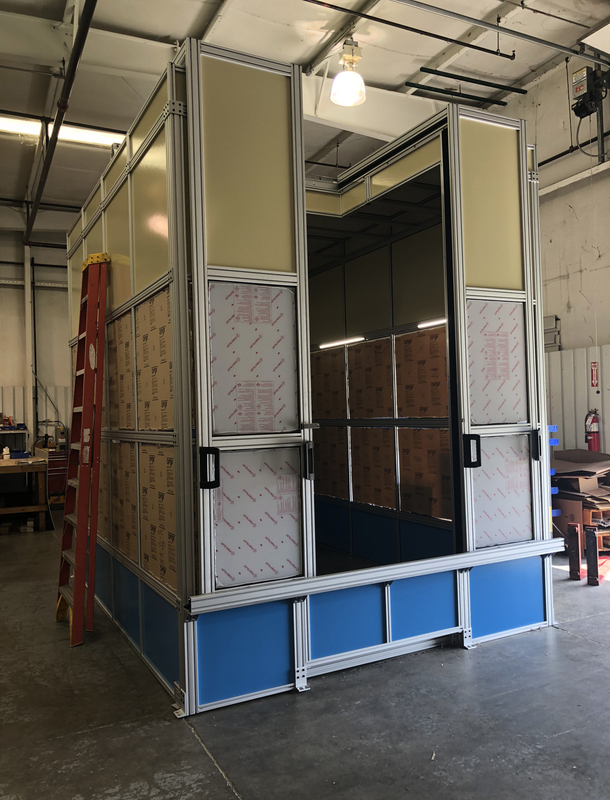 What’s In This Video: Our client, a large precision bearing manufacturer, requested a large aluminum framed enclosure to protect one of their coordinate measuring machines (CMM.) 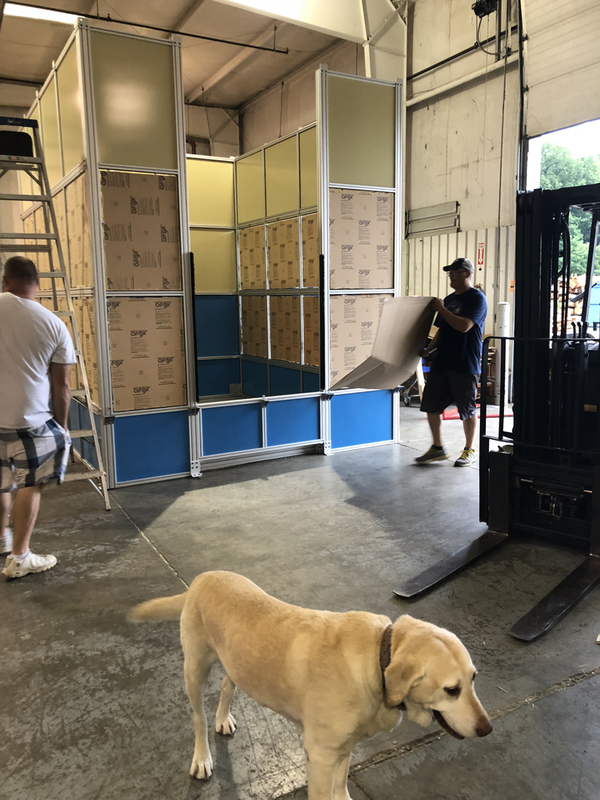 After contacting us with their ideas and specs, Alufab Inc engineers designed and created the enclosure you see in these photos below. 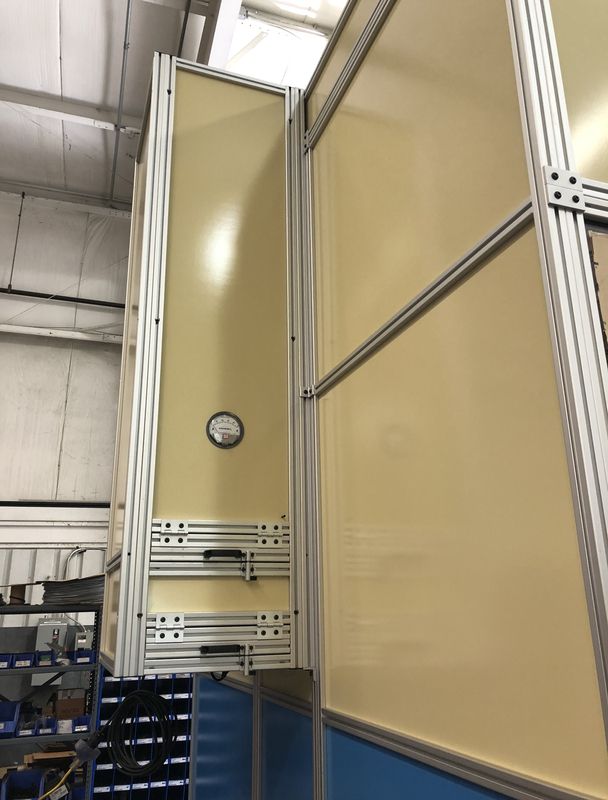 The customer also required a parts entry door that could accommodate loading by an overhead crane. The result was a custom L-shaped rolling door that opens not only the front, but a portion of the ceiling. This allows the crane’s cables and pulleys to swing in and deliver the part to the center of the machine platform. Because a CMM is susceptible to dust and particulate contamination, the enclosure is equipped with a HEPA filtered positive pressure blower- seen in the photos as a projection from the back wall. The parts entry door is designed to allow loading by an overhead crane.